My Current Hair Regimen! CURLY HAIR GALS ( & Guys) GET IN HERE! 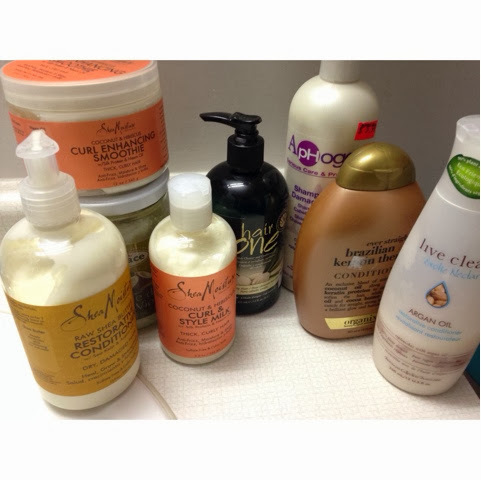 These are my current favs for my hair regimen! I have naturally curly hair, so its second nature to use a handful of products. What may work for me may not work for you or your hair type, but you could always add or subtract from what I have suggested! I only use these products when my hair is curly and not straight. Every now and then when it is straight I use a DROP of coconut oil to rehydrate my dried ends, and it is also a great heat protector! The Shea Moisture products are always super hard to find, I bought mine at Target in the states (I'm Canadian!) For my fellow Torontonians, you can track the Shea Moisture line down at a lower volume beauty supply store. They are ALWAYS sold out or on back order when I check in. Take advantage of grabbing them at Target if you or a friend is traveling to the US. She Moisture works amazingly! I can't do without them, they brought life back to my damaged curls, they have added definition and helped with my dead ends form heat damage. As for the shampoo, I use Aphrogee shampoo for damaged hair. I only use shampoo once a month, so it does not strip my hair of natural oils. However when I do wash within that time, I use my conditioners. I fluctuate between the Brazilian keratin therapy and various Argan oil conditioners.The Hair one cleanser and conditioner for curly hair has worked magic on my friends' hair, adding growth, definition to their curls, and repaired damaged ends. Exactly what I need to help restore my curls. Where to get them? Hair one is sold exclusively at Sally's Beauty Supply. Shoppers drug mart and walmart carries the live clean natural Argan oil conditioner as well as the Brazilian. You can also purchase organic cold pressed coconut oil at the grocery store, bulk barn, natural food stores, and costco. I would be happy to answer any other questions!